The Mermaid's Tale: Piltdown--and modern evolutionary frauds? We are celebrating the 100th anniversary of the famous Piltdown fraud in biological anthropology. One might think some other term, like 'commemorating, might be more apt for a fraud. But in a sense the lesson-learned from this event at least should be celebrated. Or has the lesson been learnt after all? In 1912, a lawyer and amateur antuquarian named Charles Dawson reported finding some fossil bones that resembled something like what people thought the famous 'missing link' that would connect humans evolutionarily to other apes should look like. 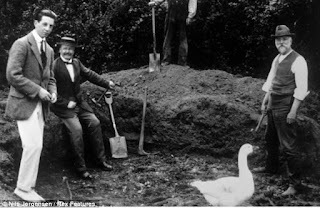 Dawson found this material in a gravel pit, near the town of Piltdown in the south of England, when he saw the material eroding out of the soil of a construction site (top image, Dawson seated; below, the crew of specialists examining the finds). He reported this excitedly, because the search had long been on to find the missing link and demonstrate that, indeed, Darwin's idea that all life, including humans, descended from a common origin on Earth. 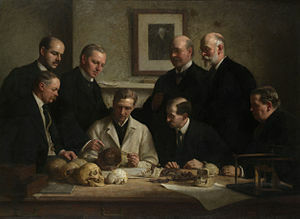 The story and relevant details are in Wikipedia: Piltdown man. Digging systematically in the site quickly occurred, to see what else might be there, and much was found that in a sense 'completed' a picture of the past. Britain's leading anatomist, Sir Arthur Smith Woodward, was called in to examine the findings. The French paleontologist (and Jesuit priest) Teilhard de Chardin came to see the site. The findings were sensationalized because not only did they provide the anticipated evidence, but they showed that England was the site of the oldest human fossil--a matter of national pride, even though Darwin had quite correctly reasoned that ultimately we originated in Africa, where our closest living relatives were to be found. 'Anticipated' is an appropriate word here, because our narcissistic pride had convinced anthropologists that our brain had led the adaptive way out of the mediocrity of other apes. The Piltdown findings included bones of other animals (prey, probably), and stone tools of various sorts, all colored similarly to the mineral soil, were quickly found. But the 'human' bones took center (or, rather, centre) stage: they included a piece of a chimp-like jaw, with some teeth whose cusps had been worn rather flat as might be found in humans, and some fragments of cranial plates--the parts encasing the brain. Reconstructions seemed to be able to make the jaw and head parts fit together. In the above image the darker bits were what were found, the rest a reconstruction made of the likely bearer of those bits.The stunning fact was that this individual had a chimp-like jaw but a large brain, and used tools. 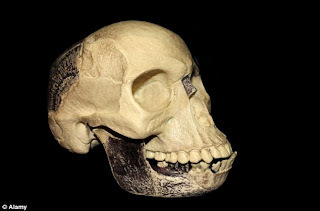 What this showed, or proved to those who analyzed the material, was that humans had evolved first by adapting a large brain and intelligence, and this was followed by humanizing the lower, less important body structures. Now, this was satisfying, but also very curious, because while it suited our preferred story of our adaptive Darwinian origins, it didn't gibe with any of the other fossils that had yet been found. So they were in a sense suspect, at least in the sense that other representatives of the missing link surely would be found sometime. But they weren't. Other fossils that seemed to show that in fact our body 'humanized' by becoming upright and attaining some of our dental characteristics before our brain enlarged, such as a famous skull found in Africa, were dismissed or ignored. It took over 40 years before careful examination of the Fossil that Changed the World showed that it was, indeed, a total fraud. The bones were recent, not fossil. The material had been intentionally, but only superficially stained to resemble the gravel in the site. The jaw was a recent ape jaw, and the skull parts from a not very old human. Teeth had been filed and altered. Debate raged for many years about who had perpetrated this hoax. Smith Woodward, Chardin, and Dawson were the leading suspects. Eventually, it was shown that many other remarkable finds that Dawson had made were fakes; Dawson wanted to be included in the august British science community, and was doing what he thought it took to get there (he died shortly after the original 'finds,' and no further finds were made after his death). We now know with extensive evidence from many parts of the world that, in contrast to Piltdown, we evolved body first and then our brains expanded. So why had the hoax had held sway for so long a time? The answer is at least in part, that the find fit our expectations, the model that anthropologists had in their heads about how we 'must' have evolved. It was a kind of egocentric view of what makes us human, what distinguishes us and hence what we must, in a sense, have evolved 'for': thinking advanced thoughts (such as science!). Only when other evidence began accumulating was the diligence invested in seeing if Piltdown's strange configuration really was true. Then, the fraud was quickly explored. The lesson was that science, like religion or other areas of human endeavor, is a social system with the kinds of layered beliefs, commitments, and agreed-on lore that any social system has. It is not just about objective fact. In this case, something that was too good to be true wasn't true, but the fact that the leaders of the field had for a half-century been duped showed something serious about the depth to which preconceptions control even science. Have we--evolutionary biologists and anthropologists alike--as a group actually learned the Piltdown lesson, a century on? Certainly technologies make it much more difficult to perpetrate a blatant fraud of this sort. But from time to time we do see prominent frauds of comparable seriousness being accepted until being discovered, often by luck (recently, for example, the Korean geneticist's faked cloning of a human). There are others in the literature, and of course these include only the ones that have been outed. How much remains undiscovered is unknowable, and especially in this era when so much detailed technology (such as whole genome sequencing on lots of individuals, or exotic transgenic experiments) is involved, it is very hard to confirm a study. Likewise, the proliferation of journals worldwide stresses the review process and inundates us with things not checkable in any practical sense. Unless it is very fundamental, we tend to accept a finding and build our work around the results. So in evolutionary, genetic, and developmental biology, even today we may be at least a bit too ready to accept, or unwilling or unable to test, claims that are made--if they fit our expectations or, one should say, preconceptions and assumptions. In this there's a more subtle, but perhaps much more important sense in which the Piltdown lesson has not been learned. So committed are we to Darwinism, that we indulge ourselves very deeply in a commitment to a particular view of evolution and genetics, in which causation is quite deterministic and, especially, in which everything that can't be nailed down is assumed to have an explanation that involves adaptive natural selection--almost as if it were directed, force-like, toward an end. The media--popular as well as scientific--are riddled daily with uncritical, glib, Just-So stories about how and why things evolved for a particular reason, and these are swallowed by scientists and public alike more readily than the whale swallowed Jonah. Everywhere you turn you can find such tales, and the web only makes them more numerous and more likely to go viral, and become a sort of accepted truth. The drug of popularity and credit that the web provides encourages this. Skeptics of such tales are usually ignored, but even junk stories that are widely rejected don't slow down the same people from inventing more of them. Since we can look at what we see today and invent multiple possible stories that would be consistent with the data, even a total adaptationist should be skeptical and circumspect about any one of them. But such skepticism is rare, and disagreement is itself often not sufficiently circumspect, but instead consists of the skeptic's alternative Just-So story. In a subtle and perhaps less blatant way, one Piltdown is replaced with another. A fraud is an intentional or knowing misrepresentation. Whether such stories as are told today are harmful in a practical sense is debatable. Are they 'frauds'? Does the occasional brief caveat, such as saying the [trait] 'might' have been evolved for such-and-such, exculpate the author if buried amidst overstatement? Well, such stories reflect what must be judged as culpable credulousness if they're based on assumptions extended far beyond what we know very well that we can actually test or verify--and are thus told with a sense of certainty comparably far from what we actually know is justified. They are misleading because they are glibly told and the proof is how easily they are often accepted. They are stories told, often knowingly, in a way that (as with Dawson) may generate a lot of attention for those who propose them. Such stories harm the search for truth. Science needs working frameworks, but they should not be cages. In medical, societal, political, and other arenas, pat stories like the genes 'for' or adapted 'for' stories--affect policy in ways that can't be guaranteed to be good. A century of eugenics based on essentially the same kinds and quality of reasoning shows that clearly. The way to celebrate Dawson's fraud, is to recognize the role of belief even in science, and to stop committing new instances of our own.